Humpback whales migrate up to 16,000 miles each year and feed mainly in the summer in polar waters and migrate to tropical waters to breed and give birth in the winter. During the winter, humpbacks fast and live off their fat reserves; their diet consists of krill and small fish. Humpback whales like all baleen whales are seasonal feeders that feed on crustaceans, plankton, and small fish. A humpback whale will eat about 5,000 pounds of plankton, krill and small fish every day during the feeding season, one feeding technique they use is called bubble net fishing. This is where a group of humpback whales swim rapidly in circles around a school of fish and blow air through their blowholes. The bubbles form a barrier that helps to confine the school of fish within an area, and then one or more whales will swim upwards and through the bubble net with their mouth’s wide open and gulp thousands of fish. Humpback whales breathe air at the surface of the water through two blowholes located near the top of the head. Their blow is a double stream of spray that rises 10-13 feet above the surface of the water. The tail flukes of a humpback whale, which are lifted high in the dive sequence, have wavy rear edges. The deeply-notched flukes (tail) are between 10- 12 feet wide, an adult usually ranges between 39-52 feet long and weighs approximately 36 tons, and these whales can live between 50-70 years. The pectoral fins are up to one-third of a humpback whales body length and have rough edges; these are the largest flippers of any whale. They also have about 15-35 throat grooves, these grooves allow the throat to expand when they are filter feeding. Female whales breed every 2-3 years and their gestation period is eleven months, the calves are about 14 feet long when born and are nursed by their mothers for their first six months and then go through another period of nursing and independent feeding for another six months. Both males and females reach sexual maturity around the age of five, full maturity is around 15 years, females are slightly larger than males. Both male and female humpback whales vocalize, however only males produce the long, loud, complex songs for which this whale is famous for. Each song consists of sounds in a low register that vary in amplitude and frequency, and typically lasts from 10 to 20 minutes. 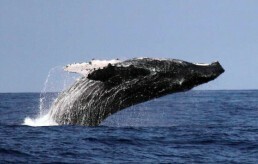 Humpbacks may sing continuously for more than 24 hours. Cetaceans have no vocal cords, so whales generate their song by forcing air through their massive nasal cavities. Scientists are unsure of the purpose of the whale song. Only males sing, suggesting that one purpose is to attract females. However, many of the whales observed to approach a singer are other males, and results in conflict. Singing may therefore be a challenge to other males. Some scientists say that the song may serve an echo locative function. During the feeding season, humpbacks make altogether different vocalizations for herding fish into their bubble nets. Humpback whales have also been found to make a range of other social sounds to communicate such as “grunts”, “groans”, “snorts” and “barks”.